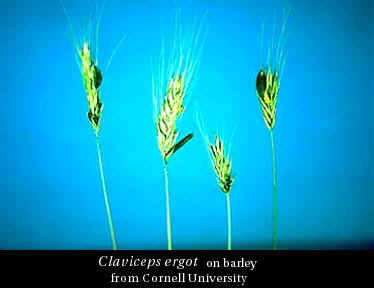 Ergot is a fungal disease of rye, barley and wheat caused by fungi Cleviceps ergot. The disease appears as a blackish-purple club shaped growth (known as head of ergot) on the tops of grain seeds. It has a rough surface and may be as much as four times as large as the grain kernel it replaces. The ideal condition for ergot contamination is wet and cool spring. Ergot body contains a number of alkaloids and amines which can cause health problems in both animals and people. Ergot contaminated food consumption may cause vomiting, diarrhea and even gangrene in serous cases. It also has a poisonous effect on the central nervous system. LSD- a psychoactive drug was first synthesized from ergot compounds. Ergot was a widespread contamination of cereal grains in Europe during middle ages. Heat cannot break down psychoactive components of ergot; therefore, they exist in breads baked from infected grains. A major outbreak of ergot poisoning occurred in France in early 1950s. In 1951, nearly 135 people had to be hospitalized and 6 died from ergot poisoning in the French town of Pont St. Esprit. They ate bread made from fungus infected rye. The victims had horrible visions of being attacked by tigers and snakes and of turning into beasts. Experiences of this outbreak provide a good insight into what people might have experienced in medieval times. Symptoms of ergot poisoning include hallucinations (the 1950’s French victims reported ‘being chased or attacked by horrible beasts’, ‘terror of dark’ and ‘feeling that my body was not mine’) together with burning sensations (commonly known as St. Anthony’s fire ) in the extremities & the scalp. It is not hard to imagine how an outbreak of ergot-poisoning or, more likely, an ongoing low level of contamination, could lead to the development of werewolf-legend, the ‘pursuit by horrible beasts’ hallucination was probably the most likely cause. Furthermore, ‘tingling and loss of sensation in the extremities’ could possibly have been interpreted as shape shifting. Hallucinogen drugs act on the central nervous system and produce significant change to user’s state of consciousness by distorting the perception of reality up to the point when hallucination occurs. At that point people may see or hear things that aren’t really there, or they may see a distorted image of surroundings. Hallucinogens include a wide variety of products form artificially synthesized chemicals to natural plant extracts. LSD, magic mushrooms, mescaline, PCP and marijuana are some examples of hallucinogens. Effect of hallucinogens on any person depends on dose, user’s past experience and circumstances (place, user’s psychological and emotional stability, presence of other people etc.) under which they are taken. User’s reaction can range from ecstasy to terror. In fact, during a single hallucinogenic episode, a user is likely to experience various psychic and emotional reactions. It can be pleasant at one time and disturbing and threatening at another time. Regular use of such hallucinogens like LSD, mescaline, and psilocybin induce tolerance within a few days: that is, little or no effect is experienced even with high doses. Cross-tolerance is also developed by usage of LSD, mescaline, psilocybin, and DMT; that is, a person who has built up tolerance to one will be unable to experience the effects of another one. Normal sensation is usually restored after abstention for several consecutive days. Chronic users may become psychologically dependent on hallucinogens. Psychological dependence exists when a drug is so central to a person's thoughts, emotions, and activities that the need to continue becomes compulsory. Hallucinogens do not appear to cause physical dependence; reactions have not been observed for withdrawal even after long-time usage. In the light of psychiatry hallucination can be defined as “perception without corresponding stimuli” (Swiss psychiatrist E. Bleuler) or as the “apparent perception of an external object when no such object is present” (L. E. Hinsie and J. Shatzky, Psychiatric Dictionary, 1940). In other words, hallucination is the experience of perceiving objects or events that do not exist. For example, a person may hear or see things that no one else seems to hear or see. It involves all five five sensory perceptual distortion, seeing, hearing, smelling, feeling and tasting that others would not sense at all. Persistent hallucination is a symptom of schizophrenia. There is a basic difference between illusion and hallucination. If some external object is present but inadequately recognized, an incorrect perception occurs and causes illusion. By comparison, in the absence of such external object the incorrect perception is called hallucination. Hallucinations may be produced by chemical changes derived from internal metabolic disturbances or from outside of the body. Some chemicals that produce hallucinations seem to reduce sensory inputs; for example, dramatic hallucinatory recall of intense experiences from the recent past. Hallucinations during induction of (and emergence from) general surgical anesthesia induced by a variety of other chemicals can be explained on the same basis. Some hallucinogenic chemicals seem to impair sensory inputs by decreasing the transmission of nerval impulses by increasing the resistance of the nervous system to their passage. On the contrary, some other hallucinogens increase nerve transmissions, disrupting the orderly input of information and "jamming the circuits." Many botanically derived hallucinogens seem to function this way--e.g., LSD (lysergic acid diethylamide), ergot (a fungus that grows on rye), psilocybin (derived from mushrooms), mescaline (derived from the peyote cactus), and tetrahydrocannabinol or THC (derived from marijuana). Hallucinations also can be induced by jamming the circuits through input overload produced mechanically, bombarding several sensory systems with intense stimuli simultaneously (e.g., with bright flashing lights with loud noises). Hallucinogenic drugs are substances that, administered in pharmacological doses (not toxic overdoses), create gross distortions in perception without causing unconsciousness. These distortions frequently include hallucinations. Such compounds also are likely to exert profound effects on mood, thought, and observable behavior of the user. Lysergic Acid Diethylamide or LSD is one of the most powerful hallucinogens that radically changes a person’s mental state by distorting the perception of reality. It was first synthesized in 1968 form ergot fungus which grows on rye and other grains. Pure LSD is odorless and tasteless white crystalline powder. In streets it is found in forms of tablets, capsules, little pills and very small pieces of blotting papers with pictures on them. There are also some slang names for LSD like acid, tabs, blotters, microdots, stars, white lighting, purple mike, blue mike, windows, superman and strawberries. LSD is usually taken orally. Sometimes it is injected or inhaled as well. Even a very small amount like 50 to 100 micrograms ( 1 microgram is 1/1000 of a milligram) can alter one’s perception to the point of hallucination. Feelings of a mystical, religious, or cosmic nature (generally the most desired effect). The user may feel several different emotions at once or swing rapidly from one emotion to another. Many users also experience unpleasant reactions to LSD. This can include feelings of paranoia, anxiety, fear and the worst, people can forget that it is the drug causing these effects. Calling these reactions "bad trips," users feel that they are losing their identity, disintegrating into nothingness, and that there is no reality. Hallucinations sometimes result in violence, homicide, or suicide. This psychotic state can last for several days or even longer. Long-term effects appear after repeated use over a lengthy period. "Flashbacks" (unpredictable, spontaneous recurrences of the original LSD experience without the user's taking the drug again) can occur weeks, months, or even up to a year after the last dose. Typically, flashbacks last only a few minutes or less and are usually consists visual images ranging from formless colors to frightening hallucinations. Chronic LSD usage may result in prolonged depression and anxiety. Tolerance to LSD's hallucinatory and physical effects develops rapidly, making larger amounts of the drug necessary to produce the same effects. There is no physical dependence on LSD after continuous use, for there are no withdrawal symptoms after the drug is discontinued. Some regular LSD users become psychologically dependent on the drug and the need to keep taking it. Popular names for Nightshade are Belladonna, Devil's Cherries, Naughty Man's Cherries, Divale, Black Cherry, Devil's Herb, Great Morel and Dwayberry. Widely distributed over Central and Southern Europe, South-west Asia and Algeria, it is also cultivated in England, France and North America. 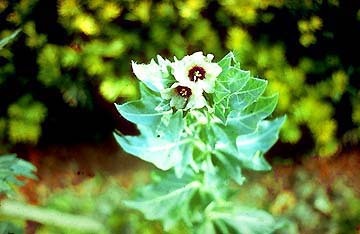 The generic name of the plant, Atropa, has derived from the Greek Atropos, the Fate that cuts the thread of human life - a reference to its deadly, poisonous nature. Description of the Plant---The 6 inches long whitish root is thick, fleshy and branching. Purplish colored stem is 2 to 4 feet high, undivided at the bas e, but dividing a little above the ground into three, each of which again branches freely. The oval shaped leaves are dull, darkish green in color and of unequal size from 3 to 10 inches long. The veins of the leaves, especially the midrib are prominent on overleaf. The flowers, which appear in June and July, and continue blooming until early September are of a dark purplish color.The berry, which ripens in September, acquires a shining black color sizes like a small cherry. It contains several seeds. The berries are full of a dark, poisonous juice, and are intensely sweet. A typical symptom of Belladonna poisoning is complete loss of voice, together with frequent bending forward of the trunk and continual movements of the hands and fingers and the pupils of the eye becoming much dilated. Swallowing an emetic, such as a large glass of warm vinegar or mustard and water as soon as possible, may prevent the poisonous effects of Belladonna berries. Its deadly character is due to the presence of an alkaloid, Atropine, 1/10 grain of which swallowed by a man has shown symptoms of poisoning. As every part of the plant is extremely poisonous, neither leaves nor berries or root should be handled if there are any cuts or abrasions on the hands. The root is the most and the berries are the most poisonous parts of Belladonna. Rabies is a viral infection that attacks the nervous system of warm-blooded men and animals. Once the symptoms of rabies develop, there is no successful treatment for it; only three patients in the medical history have survived the disease after its progression to this stage. It is very important to stop the disease from developing in people who may have been exposed to the rabies virus. To cause an infection, the rabies virus must enter the body and reach nerve cells. The virus can enter the body through broken skin. Droplets containing the virus can pass through mucous membranes in the eyes, nose, mouth or intestine. Usually, transmission occurs when rabid animals, with the virus in their saliva, bite people. The virus travel from the site of exposure to the brain through nerves. Once the virus establishes itself in the brain, it travels down and multiplies in different organs. Eventually, the virus reaches the salivary glands ant then, it releases itself into the mouth. In people, rabies appears in several stages. Initially, a person who is bitten may notice unusual feeling or tingling around the wound. Soon afterwards, there is a period of tiredness, possibly with lack of appetite, headache, fever, cough, sore throat, abdominal pain, nausea, vomiting, and diarrhea. A period of extreme worry, irritability, inability to sleep, and depression follows, possibly with hallucinations. "Furious rabies" may follow with strange behaviors including biting other people. At this stage, victims have an uncontrollable fear of water. This is why rabies has been called "Hydrophobia." Sometimes "paralytic rabies" develops instead of furious rabies. With this form of the disease, the muscles gradually become paralyzed, starting from the site of the bite or scratch. A coma slowly develops that results to the death. In animals, rabies appears in two different forms. It may appear as furious rabies in which the animal changes behavior, becomes restless, wanders aimlessly, and bites any animal, person, or object in its way. Eventually the animal becomes paralyzed in the throat and hind legs, and dies. Or it may appear as "dumb rabies" in which an animal changes behavior becomes withdrawn or more affectionate, tries to hide, experience swallowing difficulty, and dies after a few days without ever becoming violent. All animals do not behave in the same manner when they have rabies. In medieval Europe, rabies was a deadly threat. In desperation, peasants turned to St. Hubert, the patron saint of rabies victims. Thousands of people would travel to Liege and pray that they would be spared. They also prayed for those already suffering. Peasants used iron bars or crosses called the "keys" of St. Hubert to protect themselves. Some would insert the keys into the walls of their houses. Others carried them with them to protect against the curse. Patients killed themselves or were killed when bitten by a dog believed to be rabid. Most peasants heated irons and applied them to wounds left by rabid animals. Surprisingly, if applied immediately, the wound would be sterilized. Of course, this was seen as a miracle. Even when scholars denounced these rituals, the peasantry believed in the keys until the late nineteenth century. Rabies has been a horrifying, tormenting and fatal disease for humans throughout history. It is feared still today. Nonetheless, rabies can be avoided, prevented and treated. Through education, we can correct the common misconceptions, raise public awareness and promote common sense when dealing with animals and the potential threat of rabies. Science has been enlisted to aid our understanding of the satellites force. A Duke University professor has asserted that changes in the brain’s electrical activity coincide with lunar phases. Other studies connect the moon to increases in strokes and epileptic seizures. The researchers claim that drugs have greater effect, enzymes and hormones are more active, and the body’s metabolism increases during the full moon. Using less formal methods, police often note that especially violent crimes often occur during periods of full moon. The nationwide murder rate, for instance, has been alleged to jump 50 percent during a full moon, while in New York City, the incidence of arson has been said to double. Many scientists reject this so-called moon madness. They say that only the ocean tides owe this action to the moon and that any other events attributed to it can be blamed on coincidence, faulty scientific methods, or error. Still, research into lunar effects continues, a search for the orb’s enigmatic power.